A seasoned litigator, Deirdre Carey Brown focuses her practice with Hoover Slovacek on complex commercial litigation, with an emphasis on bankruptcy litigation and mediation. Whether she is advising Fortune 500 companies, banks, trustees, financial service companies, small businesses or individuals, Ms. Brown diligently seeks to understand her clients’ goals, working closely with them to achieve a “win” – however the client defines it. Ms. Brown has a strong track record of unearthing valuable documents that help her client’s case. Nonetheless, her true strength lies in the combination of her thoroughness and her commitment to winning in an ethical, cost-efficient way. She consistently serves as lead counsel on matters involving commercial litigation, collections, business-to-business disputes, landlord-tenant disputes, real estate disputes, construction litigation and bankruptcy issues. Her bankruptcy experience spans contested matters in Chapters 7, 11, 12 and 13. Prior to joining the firm, Ms. Brown clerked for the Hon. Elizabeth A. Pickett, Louisiana Third Circuit Court of Appeals, and practiced as a commercial litigator and Chapter 7 Trustee attorney, representing trustees in hundreds of avoidance and preference actions. Her advocacy extends beyond her client work. In 2012, Texas Rising Stars® by Thomson Reuters honored her as a Texas Rising Star inBankruptcy & Creditor/Debtor Rights, Business. 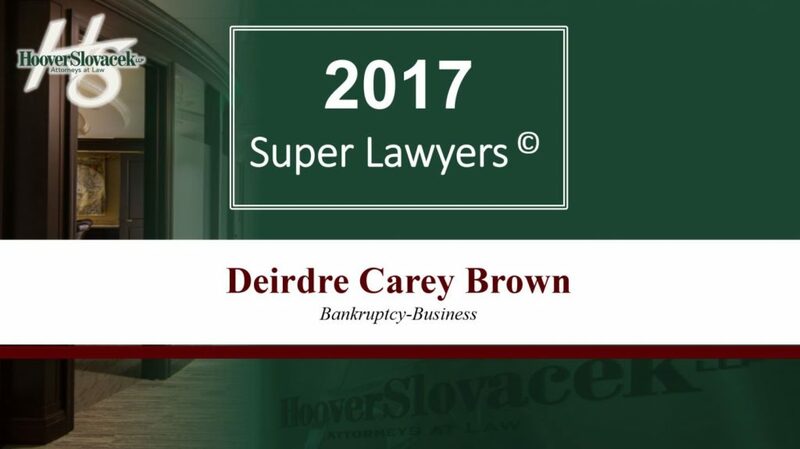 In 2016 and 2017, she was named by Texas Super Lawyers® by Thomson Reuters as a Texas Superlawyer in Bankruptcy & Creditor/Debtor Rights, Business. Additionally, the Louisiana Federation of Business and Professional Women recognized her as the “Young Careerist of the Year” (2001). Ms. Brown speaks frequently on bankruptcy law, consumer collection, real estate law, and commercial litigation. Successfully represented surety, a secured creditor, after the close of a bankruptcy case when undisclosed funds retained by the Debtor’s bank were discovered. District Court granted turnover of the undisclosed funds and recovery of attorney’s fees against the bank, which had notice of the bankruptcy. Case cited by Norton Bankruptcy Law & Practice 3d Edition. Secured favorable judgment for Chapter 7 Trustee of corporate debtor whose only officer and director allegedly faked his death. After the reported death, Debtor’s bank allowed funds to be removed from the account by the officer’s ex-wife. Bank was found liable for allowing dissipation of corporate Debtor’s bank account. Cited in several treatises, including 10 Am. Jur. 2d Banks and Financial Institutions § 762. As trial counsel, obtained a favorable judgment from the Bankruptcy Court that Chapter 11 Debtor, a general contractor, properly terminated public contract under AIA form contract provisions and that project owner wrongfully withheld payments due to Debtor. Upheld by United States District Court for the Eastern District of New Orleans and the United States Fifth Circuit Court of Appeals. Case cited to by Brunner & O’Connor Construction Law. Prevailed on motion to dismiss representing a former director and officer of Debtor who was sued by post-confirmation litigation trustee in claim for damages of over $50 million. Successfully negotiated a settlement where Debtor’s officer agreed after her deposition to transfer property claimed to be exempt homestead to the non-profit’s Bankruptcy Estate. Represented potential adoptive parents who paid adoption fees and birth mother expenses. Hired by a restaurant owner and enrolled in case after the Court granted opposing party’s motion to enforce an alleged settlement agreement. Discovered new evidence of key facts never disclosed by Plaintiff. Court vacated the judgment against restaurant owner. Handled State Court collection and bankruptcy matters for commercial energy sales agreements including standard collection efforts, obtaining adequate assurance, filing proof of claims. Represented Trustees in hundreds of avoidance and preference actions and also represented defendants in preference litigation. Favorable outcomes included getting cases voluntarily dismissed without taking any further legal action, prevailing at trial for Trustees and/or limiting liability of defendants through settlement. Represented Texas general contractor in pursuing claims in a payment dispute with the Louisiana Department of Transportation and Development under a public works contract. Negotiated settlement that provided payment to contractor without filing suit and eliminated liquidated damages. Represented Chapter 7 Trustee in several matters challenging the Debtor’s alleged Texas Homestead. Settled most cases on favorable terms. Won a case at trial, with the Court ruling the property was not exempt. Represented subcontractor in suit to recover payment for change order work on three Engineering, Procurement and Construction (“EPC”) contracts for projects in three states against a large, multi-national general contractor and reached favorable settlement after discovery completed.